Out of high season (July and August) there are an additional four ensuite rooms available located in Bambou Grove and Bambou Garden. This option provides the possibility of us accommodating up to 16 people for wedding, anniversary, birthday or special events for a group. Contact us to discuss your requirements. La Maison des Grands Bambous looks forward to welcoming you to our extremely comfortable and well-appointed bedrooms with excellent mattresses, bedside lamps, clock radio, hair dryer and tea/coffee making facilities. We try to make your stay as comfortable as possible. If something is not up to standard, please let us know immediately. Do not leave it and then write a poor review because you did not speak up at the time. We can currently offer two rooms with shared facilities (a double and a twin). The shared bathroom is exclusively for the use of these two rooms and comprises a bath with shower, washbasin and WC plus an additional WC two with handbasin. 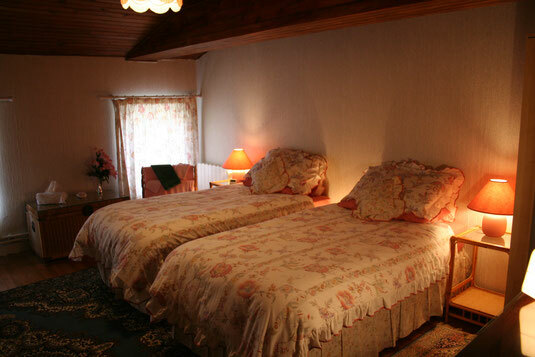 These rooms have recently been redecorated and furnished with new linen to provide a cosy feel in the rooms. The cleanliness of the facilities is very important to me but I am not always able to get into the bathroom to clean after each occupant; so we ask that you leave the facilities clean and tidy for the next occupant to avoid disappointment. The two ensuite rooms (a double and a twin) are available between September to June and are located in the cottage next to the house. They provide a living area with satellite television and the use of the refrigerator and tea and coffee making facilities. For all room rates please see our Prices page. If you are staying in our guest rooms and would like to dine with us, please let us know by 10 o’clock that morning. Meals are served in the elegant dining room on colder days in winter or on the terrace at the front of the house or by the pool. Have a look at our Dining page for more information. Any allergies, dietary requirements or dislikes, should be highlighted on the Contact Form. We are ideally located for touring or house hunting in the cognac region and golfing breaks. Our What to See and Do page provides an idea of what the area has to offer. There is something for everyone of all ages. Should you need help or advice on purchasing or renovating property, you only have to ask. We can also help with local artisans and advice on living in France..